View all Toilets & Basins. 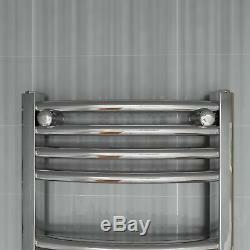 Modern Chrome Finished Heated Towel Rail. This high quality curved heated towel rail radiator is a contemporary curved towel rail radiator providing high heat output to warm your towels as well as your bathroom. Made from hard wearing steel with a durable high quality chrome finish. Number of bars: 29 (17+3+3+3+3). Provide High heat output at BTU 60°C. Distance between tapping centre : 255mm. Curved Towel Rail: Wall to C/C tapping : 52-74mm adjustable. It has a 5 year guarantee, so it not only makes your bathroom look great but keeps it warm and snug too. This high quality curved heated towel rail radiator is a contemporary curved towel radiator providing high heat output to warm your towels as well as your bathroom. It has a 5 year guarantee , so it not only makes your bathroom look great but keeps it warm and snug too. Number of bars: 26 (10+6+6+4). Durable high quality Chrome finish. Works with: Central Heating System. BTU Output at 60ºC : 3312. Manufactured under BS EN ISO 9001 quality standards. Pressure tested to 10 bar / maximum working pressure 7 bar. Outputs quoted are based on a mean water temperature of 70ºC and a room temperature of 20ºC. Our Heated Towel Rail is made with high standards, that we are confident to offer 5 Years guarantee for your peace of mind. 15mm ½Straight & Angled Chrome Designer Thermostatic Radiator Towel Rail Valves. You can update your telephone number by following the steps below. On registered name and address. Please make sure your address and contact details are up to date. If you are not at home the courier will leave a card through your door. This will give you instructions on how to retrieve your order at your convenience. Please check your address and day time contact details are correct. Your order will be dispatched by Courier. The courier delivers your order. You can also pay by card. Customers from EU countries are responsible to pay for and return the item. 1080 x 550mm Designer Flat Panel Bathroom Heated Towel Rail Radiator Chrome. 1080 x 550mm Designer Flat Panel Bathroom Heated Towel Rail Radiator Anthracite. 700 x 500mm Bathroom Designer Curved Ladder Heated Towel Rail Radiator - Chrome. 1200 x 500mm Designer Flat Panel Bathroom Heated Towel Rail Radiator Anthracite. 1100 x 500mm Bathroom Designer Straight Ladder Heated Towel Rail Radiator-Chrome. 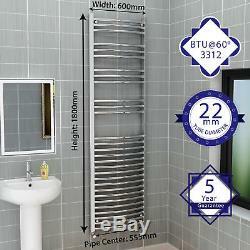 1600 x 400mm Curved Bathroom Heated Towel Rail Radiator Chrome Central Heating. 1000 x 500mm Straight Bathroom Heated Towel Rail Radiator Chrome Central Heating. 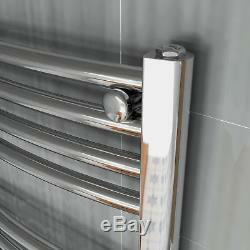 1000 x 300mm Curved Bathroom Heated Towel Rail Radiator Chrome Central Heating. 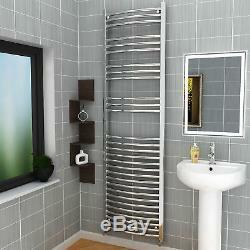 1600 x 300mm Curved Bathroom Heated Towel Rail Radiator Chrome Central Heating. 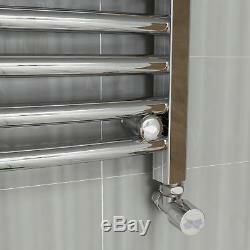 1800 x 600mm Curved Bathroom Heated Towel Rail Radiator Chrome Central Heating. Perfect towel radiator minimalist valve! Rectangle/Square/Quadrant Bathroom Shower Enclosure 40mm Slimline Stone Tray. 6mm Glass Quadrant Shower Enclosure Walk In Corner Cubicle Glass Door High Tray. Get the updates from our new range, our amazing deals and the Discount Price offers. The item "1800 x 600mm Curved Bathroom Heated Towel Rail Radiator Chrome Central Heating" is in sale since Friday, July 20, 2018. This item is in the category "Home, Furniture & DIY\Bath\Towel Rails". The seller is "luxury-bathrooms" and is located in GB.